Can High Humidity Affect Your Hearing Aids? Learn how humidity can affect your hearing aids. Your hearing aid allows you to experience the world through the sounds you miss out on with hearing loss. Naturally, you will be wearing your hearing aids through your day-to-day life, which can be unpredictable at times. Sometimes, weather or other factors may impact your hearing aids, just like any other piece of equipment you use in your life. Exposing your hearing aid, no matter the type, to humidity can affect the device’s inner mechanisms, which could cause problems over time. Read on for our helpful guide to humidity, how it can affect your hearing aids, and how to prevent damage to your hearing aids through exposure to humidity. Humidity is a way to measure the amount of moisture in the air. Temperature, climate, and weather conditions can determine humidity on a given day. For example, hot air can hold water vapor and moisture better than cold air, so humidity on a cold day can be riskier for your hearing aids. When the air is humid, and when you sweat, you may find that moisture builds up within your hearing aids, clogging and even corroding the mechanisms inside. Prolonged exposure to humid environments, or long term use of hearing aids in all types of weather and climates, can cause damage to your hearing aids that will cause them to work improperly or make it more difficult to hear. 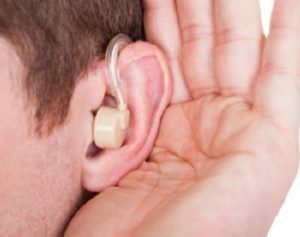 In these cases, you may need a simple fix, such as a battery change, or even replacement hearing aids. Luckily, there are several ways to prevent damage to your hearing aids related to humidity. Talk to your hearing aid specialist about your options. There are some hearing aids on the market with a higher water resistance rating (or IP rating), as well as nanocoating that can help protect your devices from moisture. If you know you will be exercising a lot with your hearing aids, you can even find hearing aid sweatbands that will allow you to hear while protecting your devices. These are great options for people who exercise outdoors, such as runners or cyclists who use traffic roads and need to remain aware. But if you won’t be needing to stay alert during your workout, remember to remove your hearing aids before exercising to avoid moisture buildup, and store them in a drying device when not in use to extend the life of your hearing aids. Contact Bay Area Audiology Today for Your Hearing Aid Care! This entry was posted on Friday, January 25th, 2019 at 12:24 pm. Both comments and pings are currently closed.